UC Browser has launched a new mobile news channel dedicated to women, with an aim to bring the best of women-related content on a single platform. UC Browser is partnering with select media organizations and UC We-Media bloggers to offer women-oriented stories and information in the field of education, health, fashion, lifestyle, relationships and more. 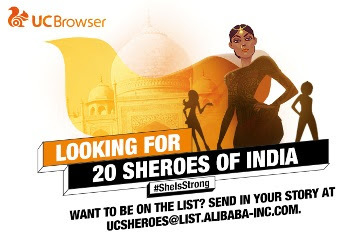 UC Browser has also kicked off a campaign to select 20 Sheros or real-life female heroes of India with an aim to publish their inspirational stories on its platform. Currently, this channel will be available in the Hindi language while the English channel will be made available soon. In addition to the inspiring Sheroes stories, the channel will also promote special occasions such as Mother’s Day celebration, to drive discussion topics and increase user engagement to raise awareness about women’s welfare.